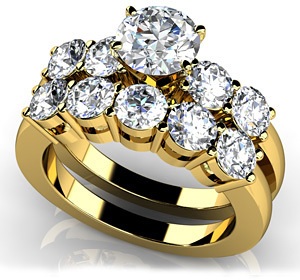 This bridal set, carefully crafted in your choice of gold or platinum, will most certainly take her breath away! The engagement ring is simply brilliant and features 2 fabulous diamonds on each side. The center stone, set in a classic four-prong design, sits perfectly in the center, reigning over a court of gems! You can choose its size! Every stone is set in the lovely, four prong setting… a timeless choice! The fabulous, matching wedding band features 5 lovely diamonds across the top of the ring, and the combination of these two is truly elegant! Approx. Metal Weight: 8.30 Gr. Model Carat Weight: 2.89 ct. Effective Carat Weight: 2.89 ct.